A lockout/tagout (LOTO) procedure is a safety system used to prevent accidental or unauthorized access to electrical power sources that are undergoing maintenance or other work. With this secured process, all individuals working on a same circuit or equipment have their own personal lock that they secure onto a disconnect device before working on the system. The LOTO procedure also requires that each worker fills out a tag that is hung from their lock, including their name and a description of the work they are doing. When multiple areas are being worked on simultaneously, the worker must use as many of locks as necessary to secure power from the system. A standard lockout/tagout procedure starts with identifying all potential power sources for the equipment being worked on. 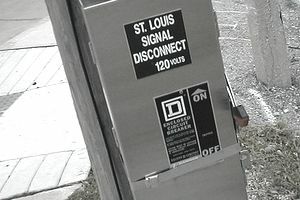 Some equipment is fed only by a single switch, while other equipment may include capacitors or backup batteries that must discharged or disconnected to ensure the equipment does not receive power. Prepare to shut down: All workers in the area are notified of the pending power shutdown and the lockout/tagout procedure. Machine shutdown: The machine or equipment connected to the serviced line or circuit is turned off to prevent hazard to workers as a result of equipment de-energization. Electrical disconnect switches should never be pulled while under load (while the motor or other equipment they serve are still running), because of the possibility of arcing or even explosion. Equipment isolation: All switches, disconnects, or isolating devices needed to control the machine must be located and activated so that the equipment is isolated from the energy source (the power supply is shut off). Lockout/tagout: Each worker who will work on the equipment applies a lock and tag to the lockout device. Every lock and tag should show the name of the person who locked the equipment. Locks and tags should be standardized by color, shape, or size. Stored energy: All stored energy (such as electricity stored in capacitors or batteries) must be discharged, disconnected, and/or restrained and rendered safe. Workers must verify that there is no possibility of re-accumulation of stored energy. Verification of isolation: De-energized equipment is checked to confirm that there is no power present. Workers may operate switches or other normal controls to verify that all energy sources have been disconnected and the equipment will not operate. There are also specific steps to complete after the work on the equipment has concluded and before the locks and tags are removed. Workers must inspect the working area to ensure that all items have been removed from the equipment and that all covers and protection devices are back in place. All workers in the area must be alerted that the power will be turned on. They should maintain a safe distance from the serviced equipment in case any problem arises when the power comes back on. To complete the lockout/tagout procedure, all locks and lockout devices (as applicable) are removed from the disconnect switch or isolation device, indicating that the last worker gives authorization to re-energize the line.